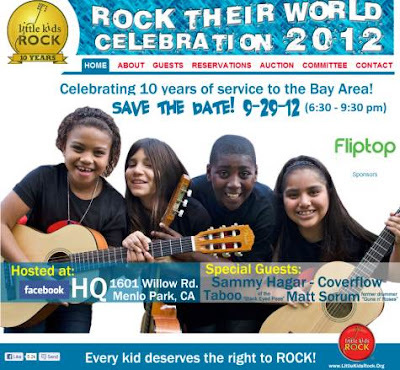 On Saturday, September 29, Sammy Hagar and Matt Sorum are among the musicians that will be at Facebook headquarters in Menlo Park, California to support music education at the inaugural "Rock Their World Celebration," a fundraiser and celebration of national nonprofit Little Kids Rock's decade of service, restoring and revitalizing music education for disadvantaged public schools nationwide. Little Kids Rock makes this possible by training teachers to teach their students to perform, improvise and compose the music kids love - pop, rock, reggae, funk, blues, rap and hip-hop. Little Kids Rock also provides all the instruments and resources necessary for teachers in underfunded public schools to reverse the trend of budget cuts by restoring and revitalizing music programs for their students. What began as an informal project led by a handful of volunteers has since catapulted onto the national stage, revitalizing modern public school music education. Today, Little Kids Rock is one of the leading providers of free musical instruments and instruction in the US, reaching more than 74,000 disadvantaged students in 25 cities across the nation... and they are expanding to more schools and cities. As pat of the “Rock their World Celebration,” the program is hosting an online fundraising auction featuring a variety of autographed and music-related items – check it out here. For more details on Little Kids Rock, visit their website here.